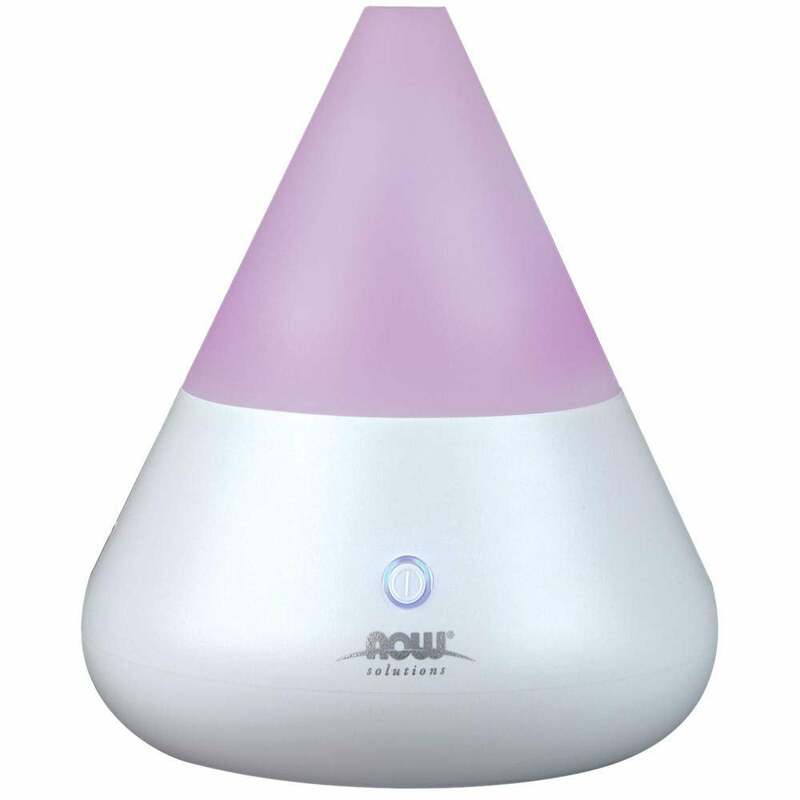 A great all-around essential oil diffuser. Emits a steady stream of fine aromatic mist and humidifies the air too. Runs quietly for up to 4 hours, covering 300-400 sq. ft. of space. 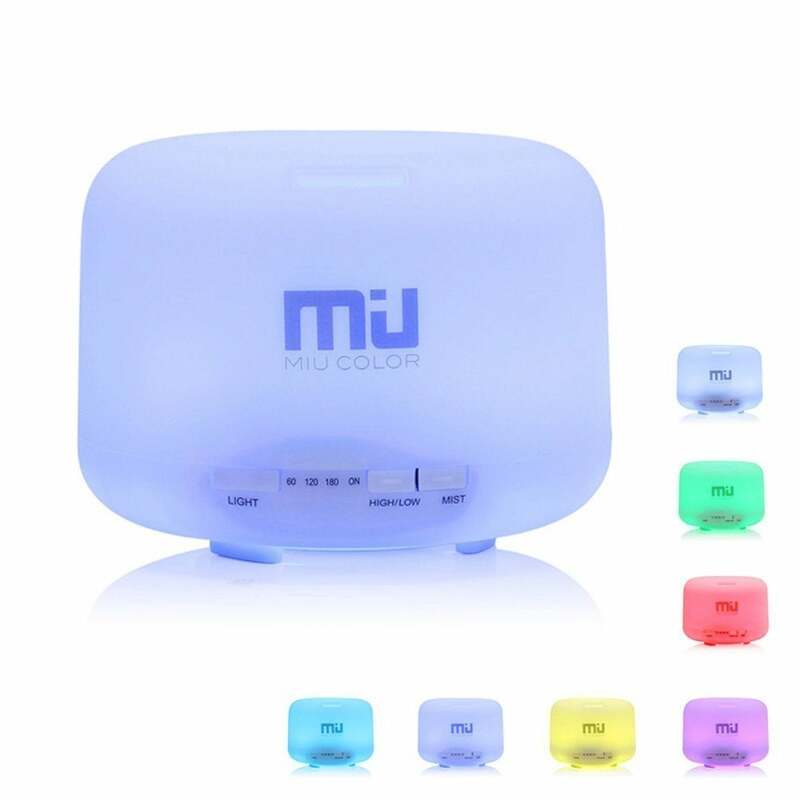 Has LED light that provides 3 color options. Easy to set up and clean. Leaves no water residue. Light is quite bright. Plastic used for the unit is not overly durable. Large water tank can hold up to 500 ml of water laced with essential oils. Can be used overnight (up to 10 hours). Effectively humidifies a 30-square-meter room. Equipped with useful extras such as a multicolor LED light that can be turned off, mist adjuster, and 5 intermittent timer settings. Buttons are hard to press. Not for long-term use. Has high ultrasonic vibration frequency–up to 2.4 million ultrasonic vibrations per second. Shoots out a powerful mist. Automatically shuts off when the water is low. Modern design with intricate detail. Small (100 ml) water tank capacity. Operates inconsistently. Hard to remove the lid. A good diffuser that due to its use of cool mist, provides a purer oil experience because oils are not chemically altered by the use of heat. Blasts cool mist as soon as the power button is turned on. Can work for up to 5 hours. Has an auto shut-off function and rotating LED lights. Some buyers report that the unit runs super quiet in the beginning then becomes really noisy after a while. It takes a while for the scent to reach all areas of a small room. A low-priced oil diffuser that you can take anywhere. Compact size makes it portable. Diffuses oil via a non-irritating ultrafine mist. BPA-free oil diffuser with non-corrosive ceramic discs. Quickly spreads the scent throughout the space. No timer setting and auto shut-off function. Doesn’t diffuse as much mist as the rest. Hard to clean. Some users raised leaking issues. Like you, we believe in the importance of essential oils and how they’re efficiently dispersed by using the best oil diffuser. For this reason, our team went over dozens of oil diffusers with a fine-tooth comb to help our readers reach a smart decision faster. To do this, we came up with a list of criteria that’s focused on active oil diffusers, their dispersing power, ability to cover a specific room size, price points, and additional features that helps users achieve beneficial results. We’ve combined an instructional guide that will help you get started in your oil diffuser journey, too. We’ve listed down the different types of oil diffusers, how best to clean them, and of course, how to efficiently use each. The strong revival of essentials oils as of late has given birth to an overwhelming list of oil diffusers. Experts know the importance of essential oils and the manner in which they’re used. The National Institutes of Health (NIH), for one, believes that essential oils are truly valuable as long as they’re used as directed. There may be hundreds of oil diffusers out there, but all of them are categorized into 2 types (active and passive), and each type has several subtypes. Check out the types of oil diffusers to know which one will work for you best. Heat Essential Oil Diffusers: An example of this is the dish-and-candle combo. Diffusion of the essential oil is achieved through the application of heat. The caveat for this type of diffuser is the rapid dispersion of concentrated essential oil and the risk for injury like burns. Heat can also change the therapeutic properties of oil as well. 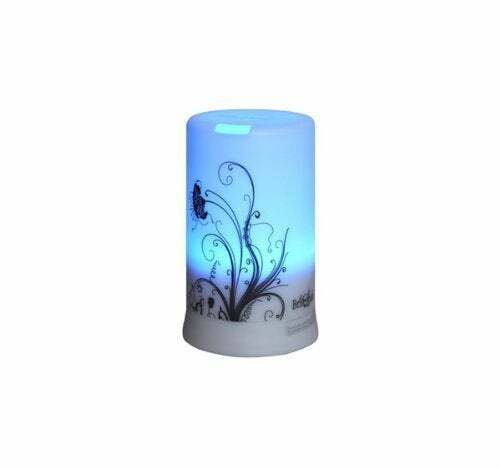 Reed Essential Oil Diffusers: This is the simplest method of essential oil diffusion. Reeds or sticks are vertically placed inside the bottle of essential oil. After a few minutes, the reeds will absorb the essential oil and diffuse it around the room. Evaporative Essential Oil Diffusers: This type of essential oil diffuser works like a heat oil diffuser except that it uses a fan rather than a candle. The fan blows directly onto a pad filled with essential oil. This causes the oil to quickly evaporate into a small area. Some favor this because the unit itself is typically cheaper than the rest. But the way it quickly disperses essential oils means that you’ll be spending more in the long run. Ultrasonic Essential Oil Diffusers: Another term for a vaporizing oil diffuser. This type uses ultrasonic vibrations to break the bond that holds oil molecules together thereby creating a super fine mist. It requires water, unlike a nebulizing oil diffuser. Another significant feature of this unit is that the noise is reduced to a comfortable level. If you want an oil diffuser that can be used overnight without any sleep disruptions, this is the one for you. Best of all, this doubles as a humidifier. 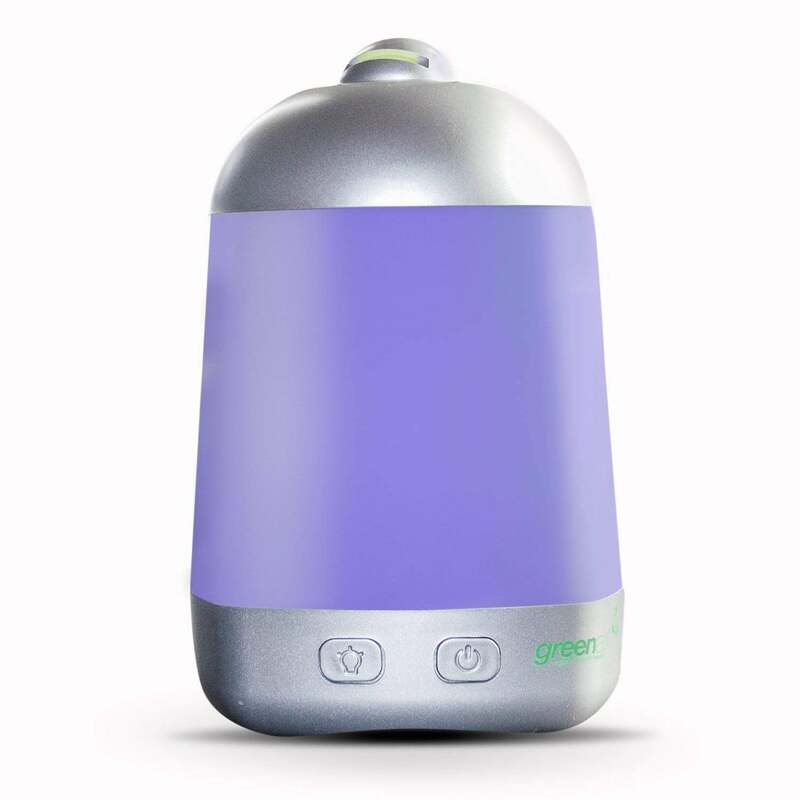 Nebulizing/Atomizing Essential Oil Diffusers: Praised for its ability to disperse a powerful mist of concentrated essential oil across a large space via pressurized air. Aside from using these in residential areas, nebulizing essential oil diffusers can effectively be used inside big commercial spaces such as yoga studios, spas, nail salons, and any store that values environmental stimulation. It requires no water and is built without plastic that can easily be degraded by certain types of oil like citrus, clove, and cinnamon. It can pump out intermittent blasts of aromatic vapors in varying degrees just like an ultrasonic oil diffuser. Knowing how to properly use your oil diffuser will help you take full advantage of its many benefits and features, as well as maximize the powerful stimulating effect of various essential oils. We decided to focus on the slightly complex types of oil diffusers and eliminated heat and reed given how easy they are to use. Slowly pour water into the water reservoir until it reaches the fill line. Protect the motor from an accidental splash by not filling the reservoir directly from the tap. Keep in mind that these are a set of general-rule-of-thumb instructions. One brand may have a slightly different set of instructions than the other, so make sure that you carefully read and follow the user manual of your chosen essential oil diffuser to avoid any problems. Check if the fan inlet is blocked by any dried-up oil. If it is, wipe it with an alcohol swab. Squeeze the excess alcohol from the swab first before wiping the area clean. Pour clean water into the reservoir, up to the specified water level. Carefully wipe the glass cover with dry paper towel. Can you leave an oil diffuser on all night? Yes. Some oil diffusers are built for overnight use. 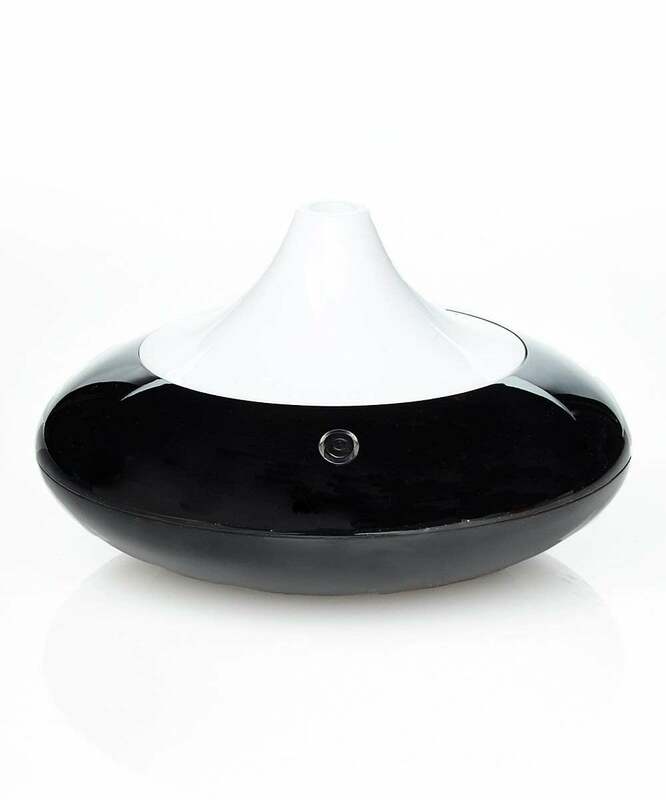 Ultrasonic oil diffusers, for one, can safely be used overnight and some brands can quietly run for up to 8 hours without the need for a refill. What should I do when an active oil diffuser stops working? First, check if the unit is properly plugged to an electric outlet. Unplug the unit before checking if there’s enough water in the reservoir or if there’s too much. Both will cause diffusion problems. Add or remove water accordingly. Remove the cover, and then drain the reservoir or remove the pad if you’re using an evaporative type. Check if there’s any blockage to the vent or fan. Remove any obstruction that you see. Pour water and add essential oils if you’re using an ultrasonic version, add essential oils to the pad of an evaporative diffuser, or pour essential oil to a nebulizing unit’s reservoir. Plug the unit then turn it on. If it’s still not working, the best thing to do is to contact the manufacturer. Can you use essential oil diffusers around babies? The concern is really about oil diffusers, but rather the kind of essential oils that should be used. But still, when it comes to babies and young children, NAHA recommends that the essential oil be diluted to 0.5% to 2.5%. The American Academy of Pediatrics is neither for nor against it. It recognizes the rise in aromatherapy use. In fact, it’s part of the Complementary and Integrative Medical Therapies study. But the AAP concludes that further study is needed. Extra precautionary measures should always be taken when it comes to this. The best thing to do is to ask your pediatrician before using one around your child. It’ll do more harm than good, experts say. In fact, ASPCA lists essential oils as one of the most common causes of toxicologic tremors in cats. Animals’ sense of smell is more acute than ours, so they’re more prone to the unwanted side effects. This can immediately cause or worsen any breathing problems that your pet may be having. There’s also the issue of safety. Your pet might accidentally knock the oil diffuser over then lick the pool of essential oil on the floor.